Well, isn’t she a beauty? She lays a mean egg, too. This whole backyard chicken thing is a relatively new experiment for the PeeMan. But, a whole host of critters, including foxes, coyotes, raccoons, hawks, and even dogs have been causing problems around chicken coops for decades. Whether it is in your back yard or a full farming operation, the need for an all-natural repellent to protect your chickens and their precious eggs has never been greater. As many of you sadly know from first-hand experience, foxes, coyotes, raccoons, hawks, and yes, even dogs eat chickens and ruin your prospects for eggs, whether you plan to eat ’em, sell ’em, or hatch ’em. Wolf urine is an effective fox and coyote deterrent that repels foxes and coyotes from your chicken coop by creating the illusion that a wolf is nearby. Wolf Urine or Coyote urine will take care of raccoons, our PeeCoy Combo is great for birds, and Bear Urin or Skunk’Umcan keep the dogs away. Now you can protect your chickens and their eggs with Wolf Pee, Coyote Pee, Bear Pee, and Skunk’Um from PredatorPee.com, the best and most reliable source for predator urines since 1986. Create a “pee-rimeter” around your chicken coop by using WolfPee liquid with ScentTags, 33 Day Dispensers or ScentWraps. 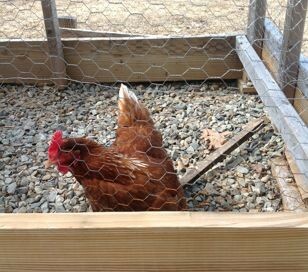 This will keep fox and coyote away from your chicken coop for good. This is not a chemical repellent, nor are there any additives whatsoever. Wolf Urine is completely natural, organic, and 100% real urine! The one thing that a fox or a coyote fears is a wolf, and wolf urine sends a clear message that a wolf is nearby. Except no substitute. Posted on April 9, 2013 by The PeeMan. This entry was posted in Informational Articles and tagged Backyard Chickens, bear pee for backyard chickens, chicken coop protection, coyote pee for chicken coops, coyote urine for chicken coops, fox urine for chicken coops, predator urine for backyard chickens, protect backyard chickens, wolf pee for chicken coops. Bookmark the permalink. ← PredatorPee for Possum Problems?